Sal Vito Pizza in Voorhees (910 Haddonfield Berlin Rd., 856-566-8486) is now offering gluten-free pizza. A manager there told me that the pizzas are made in the back of the store with separate ingredients and are baked on a dedicated tray. A cutter is also provided with the order. Emilia's Garden in West Cape May (479 W. Perry St., 609-435-5710) offers gluten-free pasta. The second part of my Expo East product round-up ran on Tuesday. 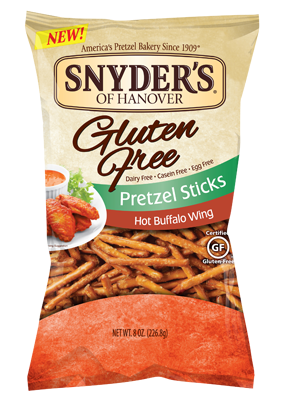 Among the mentions was Glutino's new honey mustard gluten-free pretzel twists. Next Saturday, Oct. 19, the Ravitz ShopRite in Marlton (307 Rt. 70 W., 856-983-7370) will be staging a Gluten-Free Food Festival from 10 a.m. to 2 p.m. with samples from more than 50 companies, including Absolutely Gluten Free, Annie's, Bobbi's Hummus, Bob's Red Mill, Caesar's Pasta, Enjoy Life, Feel Good Foods, Handy Crab Cakes, Kinninnick, Pamela's, Perdue and Schar. Representatives from Ravitz ShopRite, CHOP, the NFCA and the Southern New Jersey CSA chapter will be at the event, as will yours truly from 11 a.m. to 1 p.m. Come out and say hello. CHOP's Celiac Center is hosting a pre-Halloween party on Sunday, Oct. 27 from noon to 2 p.m. The event will be held at the CHOP Specialty Care & Surgery Center in Voorhees (1012 Laurel Oak Road). Guests are asked to bring their own snacks; water will be provided. To RSVP, call 215-590-2985 or email the Center. Have you been able to find the new varieties of the pretzels in any stores yet? I have been looking and haven't had any luck. Just saw them at a ShopRite near me tonight.